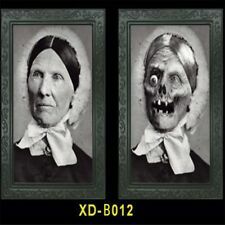 Each picture features a classic portrait that morphs into a horrifying monster filled image as you move across the picture. Product size: 38 25 cm. Pattern: B007. Color: Black. Ce vampire semble vouloir sortir du cadre pour dévorer vos invités! A propos de nous. Le cadre, en plastique fin, est noir et doré.Une image lenticulaire est fixée au centre de ce cadre. A première vue, cette image représente un portrait ancien de 2 filles.Mais en changeant d'angle de vue, on peut voir un squelette apparaitre sous ces jeunes filles. Each picture features a classic portrait that morphs into a horrifying monster filled image as you move across the picture. Product size: 38 25 cm. Pattern: B012. Color: Black. ---Includes 1 lenticular picture frame. ---Approximately 49cm x 36cm in size. ---Every frame features a twisted Halloween themed photograph that switches between a normal picture and a horrifying monster version. ---Perfect for Halloween and fantastic for any spooktacular celebration. Includes1 lenticular picture frame. Approximately 18in x 22in / 45.7cm x 55.9cm in size. Every frame features a twisted Halloween themed photograph that switches between a normal picture and a horrifying monster themed version. Perfect for Halloween and fantastic for any spooktacular celebration. Features ---Look to Forum Novelties for fun costumes, accessories and novelty items for all occasions ---Impressive decor for Halloween parties, haunted houses and more ---Move left, move right; it's a scary sight that changes before your eyes ---18 x 22 Inches. ---Includes 1 lenticular picture frame. ---Approximately 18in x 12in / 45.7cm x 30.4cm in size. ---Every frame features a twisted Halloween themed photograph that switches between a normal picture and a horrifying zombie themed version. ---Perfect for Halloween and fantastic for any spooktacular celebration. ---Includes 1 lenticular picture frame. ---Approximately 18in x 22in / 45.7cm x 55.9cm in size. ---Every frame features a twisted Halloween themed photograph that switches between a normal picture and a horrifying monster themed version. ---Perfect for Halloween and fantastic for any spooktacular celebration. Le cadre, en plastique fin, est noir et doré. Une image lenticulaire est fixée au centre de ce cadre. A première vue, cette image représente un portrait ancien de 2 filles. Mais en changeant d'angle de vue, on peut voir un squelette apparaitre sous ces jeunes filles. Each picture features a classic portrait that morphs into a horrifying monster filled image as you move across the picture. Product size: 38 25 cm. Material: PVC TPE. Lenticular holograhpic pictures. We endeavour to answer your queries within 48 working hours. Perfect to decorate the house over Halloween. work place. ONE DESIGN SENT AT RANDOM. Wherever possible we do try & re-use all our cardboard boxes. Lenticular holograhphic pictures. We endeavour to answer your queries within 48 working hours. Perfect to decorate the house over Halloween. work place. Wherever possible we do try & re-use all our cardboard boxes. Different sight when watch from different angle, moving and adjust angles to seek the secret.